Code coverage IN SPACE! Well, FOR space. Here's how to ensure code coverage testing on embedded devices using free tools with the confidence to go into space. 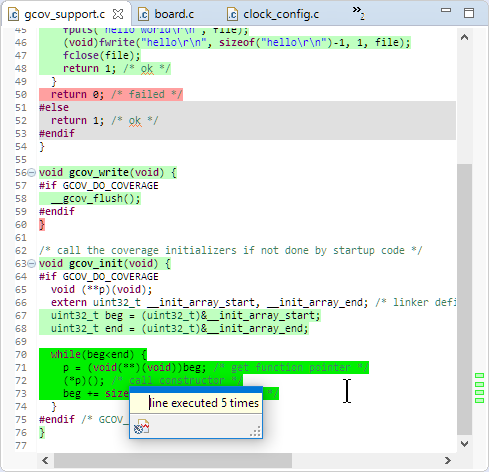 A while back (see Code Coverage for Embedded Target with Eclipse, gcc, and gcov) I wrote tutorials about how to use GNU Coverage tools (gcov) with Eclipse for development on embedded ARM Cortex-M devices. Since then, new Eclipse and ARM toolchain versions have been released. 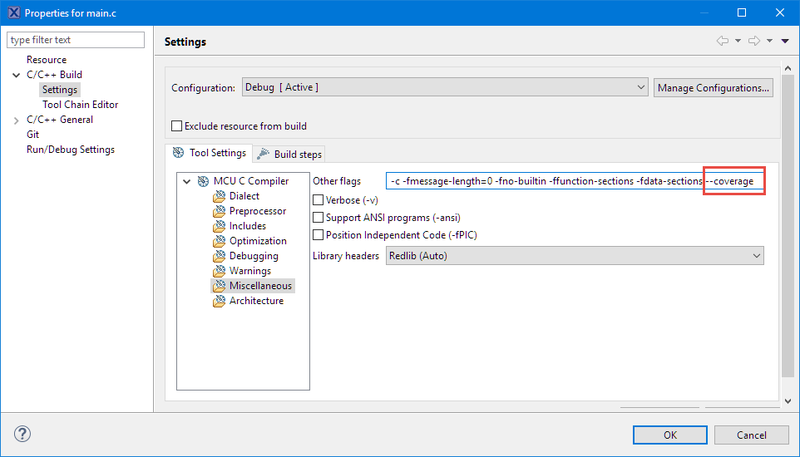 As I recently received many questions and requests on how to make it work with the MCUXpresso IDE, here we go! 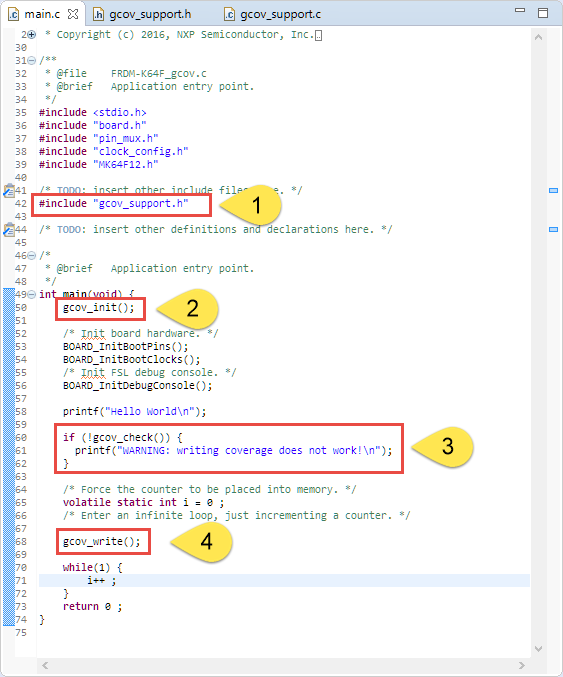 This tutorial is about how to collect coverage information using GNU gcov with the MCUXpresso IDE (Eclipse Neon with GNU Tools for ARM Embedded 5 toolchain). It describes what has to be added to projects to enable coverage, what compiler and linker settings have to be used and how to retrieve coverage information with semihosting. The article does *not* go into details how coverage works. 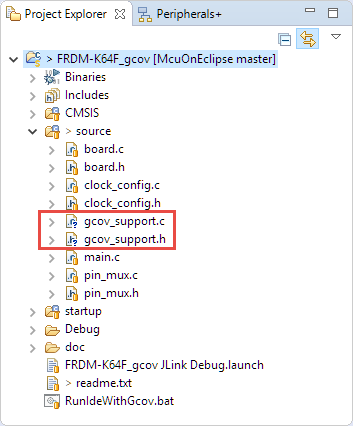 For this, please check the links at the end of this article, and especially https://mcuoneclipse.com/2014/12/26/code-coverage-for-embedded-target-with-eclipse-gcc-and-gcov/. Eclipse IDE: I’m using MCUXpresso IDE v10.0.0 (build 344), which is Eclipse Neon-based. 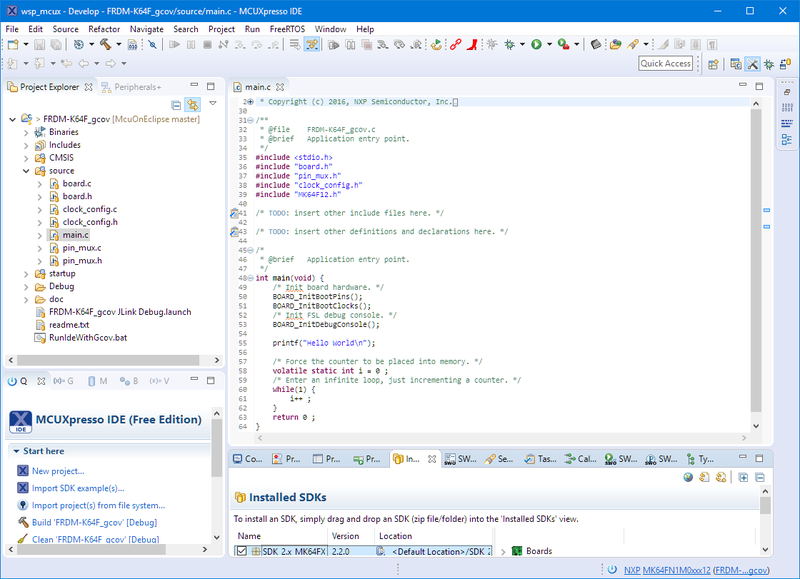 GNU Toolchain for ARM: I’m using the GNU Tools for ARM Embedded 5 – Q3 which is installed with the MCUXpresso IDE, or use the one from https://developer.arm.com/open-source/gnu-toolchain/gnu-rm. GCov Eclipse plugins: see “Adding GNU Coverage Tools to Eclipse”. 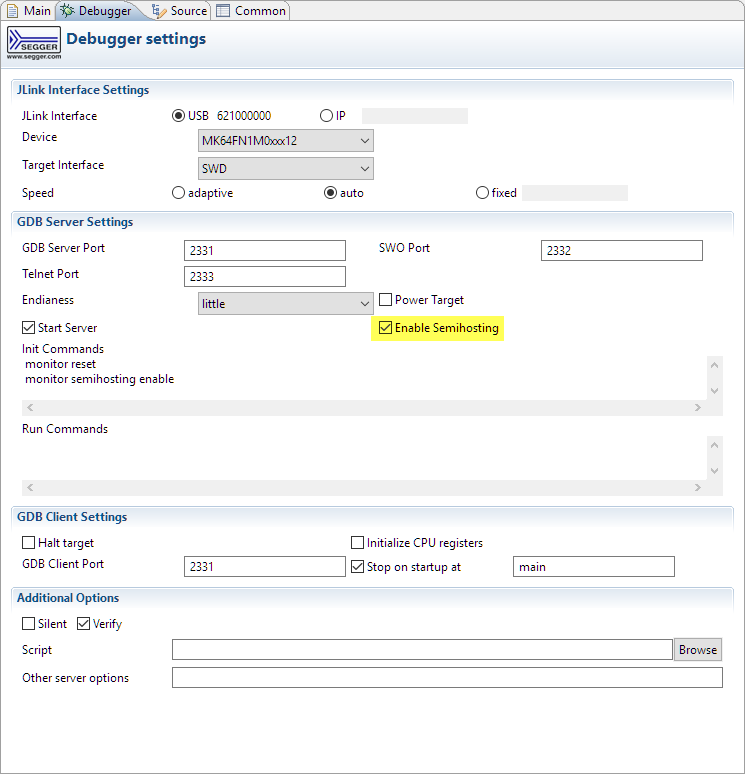 Debug probe and debug connection capable of doing file I/O semihosting: This means that the application can open, read, and write files on the host through the debug connection. In this article, I’m using the Segger J-Link debug connection. A functional and working project. I recommend you start playing with an empty or very simple project. 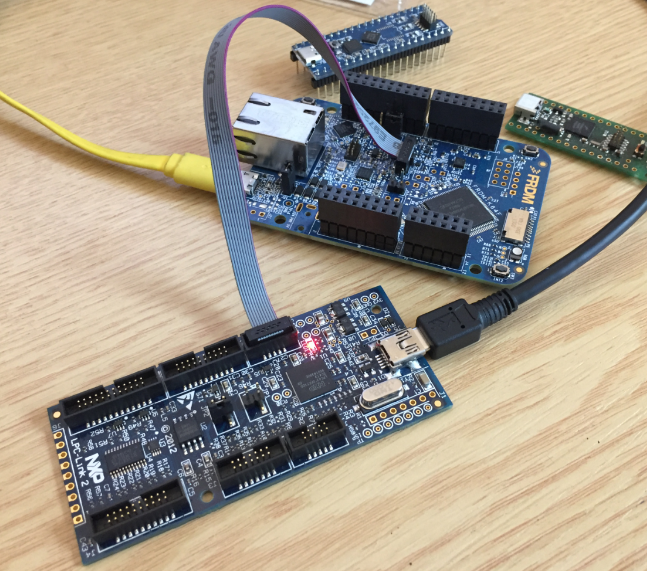 In this tutorial, I’m using a project created by the ‘new project wizard’ in the IDE for the NXP FRDM-K64F board. I’m using the MCUXpresso IDE and its included toolchain in this tutorial, but I describe things in a generic way so it should be applicable to any other configuration you have. Because the approach presented in this article depends on semihosting file I/O, I have found that not every library/debug connection configuration works for me. With the ARM gcc 5 Q3-2015 version, I was able to use semihosting file I/O with the newlib-nano, but not with the newlib library. I have not tried the gcc 6 version yet. The RedLib library in MCUXpresso IDE cannot be used, as it does not include the necessary gcov libraries. GNU ARM PEMicro Interface Debugging Support 3.0.3.201706082119 com.pemicro.debug.gdbjtag.pne.feature.feature.group P&E Microcomputer Systems Inc. In addition to the changes below, I usually create a dedicated build configuration (e.g. named ‘Coverage’) so I can switch between coverage and non-coverage mode. 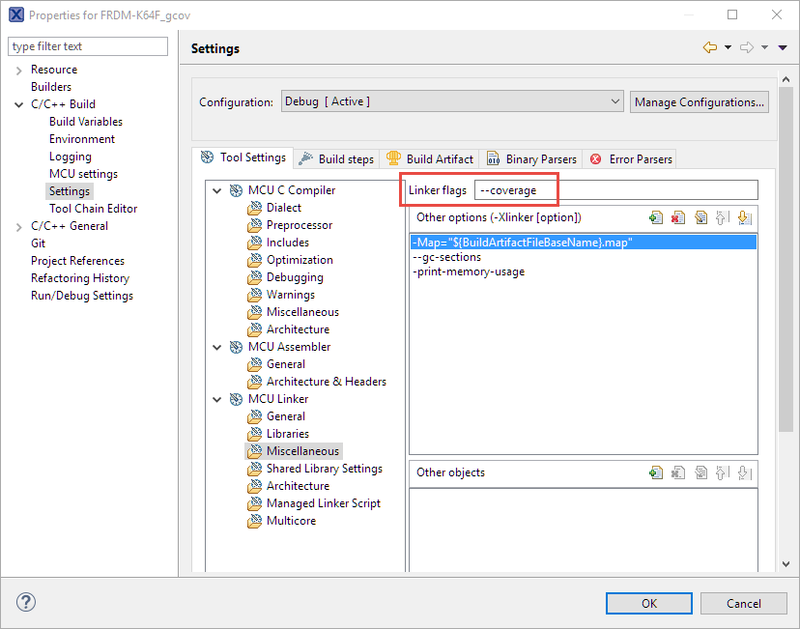 For more on how to use build configurations, see Build Configurations in Eclipse. GCOV_DO_COVERAGE: macro/setting to turn on/off coverage. 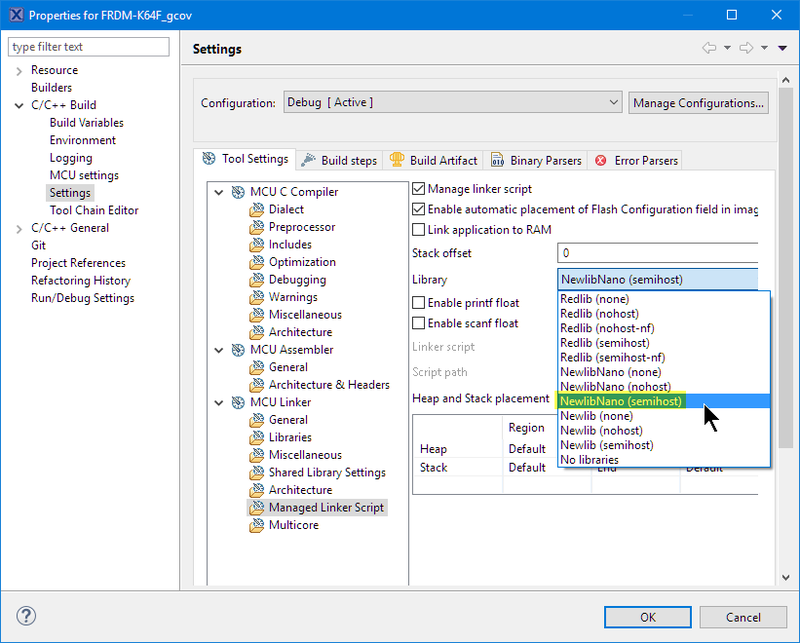 gcov_check(): function to check if semihosting file I/O is working. gcov_write(): function to write the coverage data. gcov_init(): function to initialize the coverage data. The latest version is inside the GitHub project and the files are pasted below. * \brief Support helpers to use gcov for embedded targets. * \brief Test function to verify file I/O needed for gcov information generation. * \brief Initialize the coverage information/constructors. Need to call this at the start of main(). In gcov_init(), I have to initialize the data and constructors for the gcov library. Each source file instrumented for coverage needs to be initialized properly. Because the NXP SDK startup code does not initialize these constructors, I have to call gcov_init() from my application. 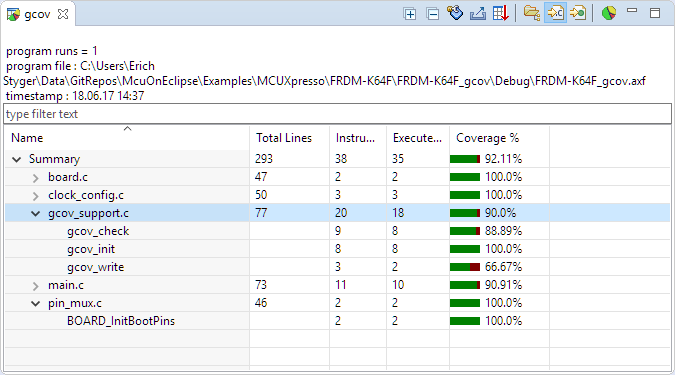 gcov_init() expects two special symbols for the start and end of the constructors, see ‘Coverage Constructors’ in Code Coverage for Embedded Target with Eclipse, gcc and gcov for details. 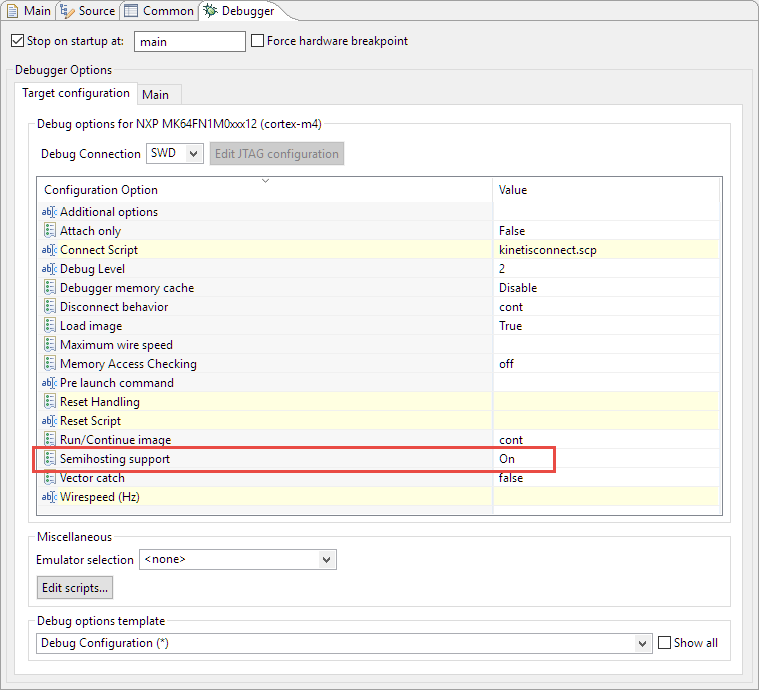 The default linker script files in MCUXpresso IDE do not generate the needed symbols. The easiest way add this is to use the concept of Linker Script Templates (see menu Help > Help Contents > MCUXpresso IDE User Guide > Memory Configuration and LinkerScripts). This will create the two extra symbols __init_array_start and __init_array_end, which are needed by gcov_init(). If not using managed linker scripts, then follow this article how to add it to the linker script file. The coverage library will use normal file I/O (fopen(), fwrite(), etc) to write the information to the host using semihosting. Usually, I don’t recommend using semihosting unless you really know what you are doing. In the case of coverage and profiling, it is actually very useful. Semihosting means that calling things like printf() or fopen() will trap/halt the target to start communication with the debugger on the host. So it is rather slow, plus if there is no debugger attached, the application on the board might stall! So don’t use semihosting if no active debug session is going on! The newlib (semihost) library did not work for me. The Redlib semihosting libraries cannot be used as they do not include the GNU coverage library. Right-click on a file or folder to set special options for it. See as well Icon and Label Decorators in Eclipse. Coverage information is combined at the end. I can run coverage for one part of the application and then for the other. The files are generated in the same folder as the object files. Make sure that you use the same version of gcov and gcc. Check if you have any other GNU tools in your system path. 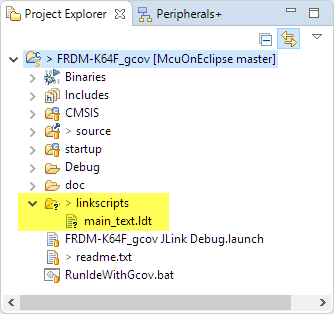 If the *.gcda files do not show up in the Eclipse Project Explorer view, do a view refresh. File I/O and other semihosting functions need a lot of stack. Increase the application and/or task stack size. Writing *.gcda files can be very slow with semihosting, depending on file size. Start instrumenting with just one file. Consider using a different debug interface/probe. For me, the Segger J-Link is three times faster with semihosting file I/O compared to CMSIS-DAP. 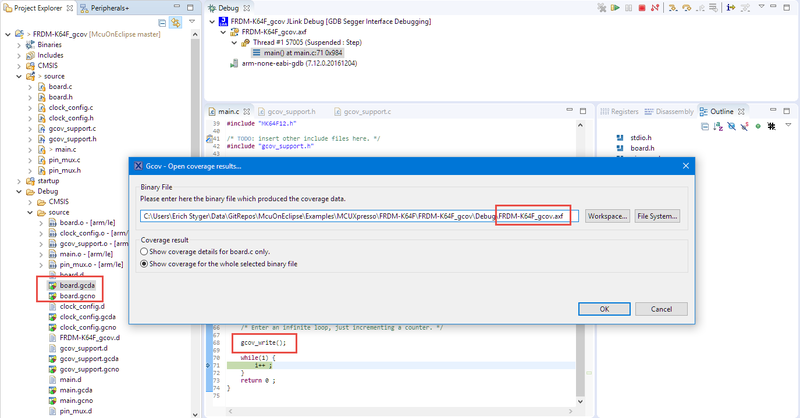 Check if gcov_check() can open a file, check the file created. If file I/O fails, verify that you are actually using a semihosting library. Make sure you are not overwriting the file I/O functions (e.g. do not use a custom _write() function which is part e.g. in the Segger RTT library). Perform a ‘clean’ or delete the output (usually ‘Debug’) folder and do a clean build. 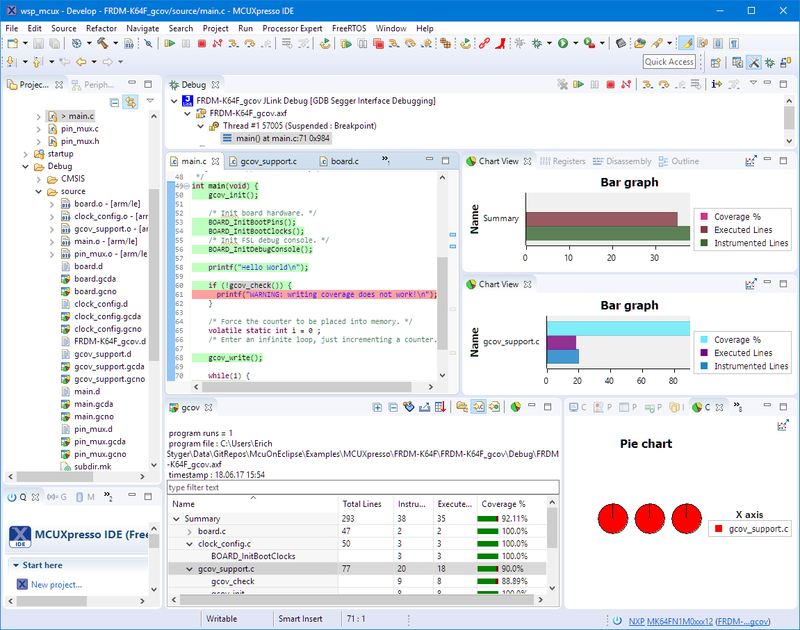 Using the Eclipse IDE for code coverage with GNU gcov is a great addition. It helps me showing progress with my automated testing, and I can easily see which code pieces are not touched by my testing yet. Using semihosting with file I/O is not the fastest way to save the coverage information to the host, but is a workable solution. I started on an experimental project to port the gcov library so I can use it to save the data to a memory device on the target system or send it to the host using any other connection method (serial, RTT, USB CDC, …). Let me know if you are interested in such a thing and I’ll see if I could write a tutorial about this.